Motionhouse's new work aims to explore the relationship between the human brain and body and the power of electricity. Created by company co-founder and artistic director Kevin Finnan, Charge connects these apparently separate entities both mentally and physically. And the 70-minute piece is certainly packed full of its own energy with six dancers, three male and three female, giving their all to the performance. 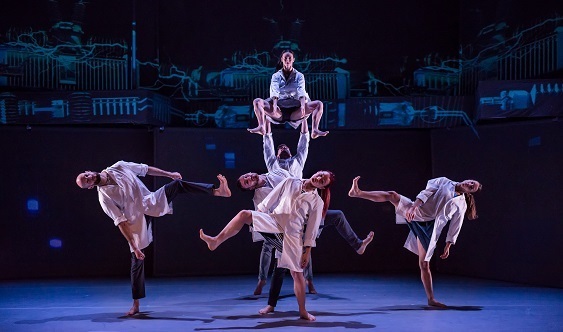 Blending dynamic dance, circus and spectacle, Charge hurtles headlong through a series of interlinking scenes all looking at different elements of our connection to electricity. Themes are varied. There are the early scientists whose experiments on twitching frogs' legs first made the connection between electricity and movement and whose work is reflected in dancers wearing lab coats and replicating those leg twitches. Then there's the human heart, itself powered by its beats, which appears projected onto each dancer as they move before all come together to form their own beating heart. Much of the human story is reflected in the piece. There are ideas of creation – from a Frankenstein-like new body to dancers taking on the guise of conception, linking eggs and sperm to form new beginnings. And there are strong themes around our relationships, how we connect to each other both physically and emotionally. 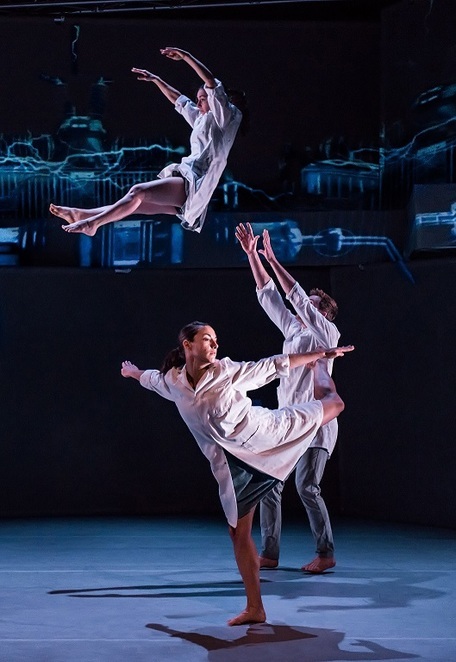 The production makes brilliant use of projection with dancers interfacing with screen images as they switch on a television, make a piece of toast or attempt to open doors only to find they don't really exist. Filmed onto the backdrop, there are also images of ultra-lit skyscrapers, cityscapes, escalators, body parts, the brain, electric charges, all following in quick-fire progression. The dancers' bodies also form screens with electrical charges and images racing across their torsos. The strength and power of the dancers is without question and yet they are also capable of intense gentleness in which a touch to the shoulder or a hand on an arm can express the importance of human connection. Set to a stunning soundtrack which captures the frenetic energy of bursts of electricity but can also pick up the beating of a human heart, Charge is so busy it's a risk to blink in case you miss something. Indeed there is so much happening, you could watch the entire production again and see different elements to the show. Motionhouse this year celebrates its 30th anniversary and over the years the company has built up a strong reputation for physically alive dance theatre – both inside venues and in outdoor settings. Charge is the third in the company's 'earth' trilogy which also features the hugely successful Scattered and Broken. Performed at Birmingham Hippodrome Theatre, Charge was preceded by two 'curtain raisers' by local young dancers inspired by the work. Recruited from five local colleges, the youngsters performed both in the foyer and on the main stage - giving audiences two opportunities to see the dancers of the future.